Welcome to Marks Cleaners. 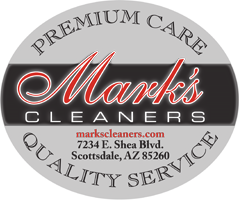 Marks Cleaners proudly serves the Scottsdale, Arizona area. For the past 25 years, we’ve built a successful business on time-honored hallmarks such as efficient service, quality results, and superb customer service. Marks Cleaners is committed to developing a relationship with each of our clients. At Marks Cleaners, we understand that when you’re looking for a dry cleaner, you’re looking for a way to protect your valuable wardrobe, and preserve the stylish, attractive look you’ve spent so much time developing. As a service to you, Marks Cleaners offers free pick up and delivery services. With gas prices soaring out of control we would like the opportunity to provide you with a convenient way to get your fine garments from point “A” to point “B”. Our efficient and complimentary service will save you both time and money, allowing you to devote your valuable time to pursuing your hobbies, instead of taking care of chores. And because we know your garments are worth it, we use extra packaging and thicker poly and tissue on all high-end clothing and accessories, including designer purses and handbags. As a family-owned business, we are passionate about what we do and we work hard every day to save you time and money! We invite you to look through the services we have to offer. Contact us to schedule a cleaning pickup and get started! Have questions about dry cleaning? Ask the expert – click here!